A dehydrated, densified cellulose fiber product specifically designed to absorb oils, solvents and other contaminates. The patented product was designed to quickly eliminate the mess from most liquid spills. Our proprietary product is engineered to be oleophilic and can be used on soil and hard surfaces. Once the contaminates are absorbed into the cell walls of Eco-Sponge™, the unwanted material is considered biodegradable. Eco-Sponge™ can absorb 4 to 8 times its volume in most absorption applications. 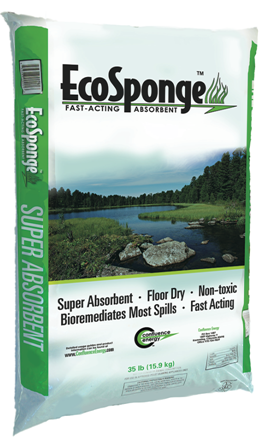 Eco-Sponge™ is utilized as a quick acting absorbent product in both residential and industrial applications. Eco-Sponge™ can be spread on any surface and will quickly absorb most aqueous spills. Spread a thin layer of Eco-Sponge over the spill. Wait a short period of time for the spill to be absorbed. Confluence Energy’s patented cocktail of microbes are designed to consume the hydrocarbons and can turn most any spills into inert material. The hydrocarbons will be encapsulated within the cell walls of Eco-Sponge™. Eco-Sponge™’s naturally occurring microorganisms will immediately begin to break down the hydrocarbons. Once the contaminates are encapsulated, the unwanted material is then considered to be biodegradable and can be left on site or disposed of in most land fills. The product works on both soil and hard surface applications. Eco-Sponge™ is also able to absorb and encapsulate heavy metals from soils and liquids. The capillary action of Eco-Sponge™ reduces issues of leaching. 3 parts liquid or impacted soil. Eco-Sponge™ can be partially rehydrated prior to mixing with Contaminated soil.